Keeping organized is such a challenge for me, and I must not be alone because there are people who make a living as Professional Organizers! I could probably use a full time professional but I’m sure I would drive them crazy! Right now I have so many projects going and I keep bouncing from project to project. Last week I was crazy busy with the kids home, Easter, work, etc. Today I am feeling disorganized and scattered, so I am going to make an attempt to organize something, anything! I wanted to hang a cork board in my office but since my office is sort of in the middle of everything I didn’t want it to look too shabby. I had a frame that I liked but I couldn’t find a piece of cork to fit it. I found lots of cheaply framed boards that were a little bigger than I needed so I bought one and broke the frame, yes broke because that was the only way to get the frame off! Once I got the frame off it was easy to cut the cork to fit my frame. I also framed a cork board for each of my kids to keep track of some of their things. It doesn’t look too bad! 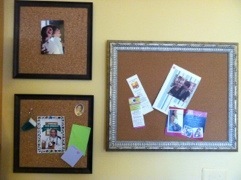 Am I more organized now that I have my cork boards? Maybe a little, but I think it will take more than a couple of pieces of cork to fix me! I do feel like I accomplished something and that works for me. Way to go Jess !!! !—now you can relax and enjoy the day !! !